David Letterman’s Netflix series My Next Guest Needs No Introduction works by breaking down the often elaborated-upon talk show formula into its most simple, elemental form: One conversation, one legendary host, one guest. (Plus a few field segments, but let’s be honest: That’s not why anybody’s tuning in.) That format only works, obviously, if said guest can carry the weight of that kind of scrutiny, i.e., if they’re interesting enough, zeitgeist-y enough, and simply “needs no introduction”-y enough to justify Letterman’s fascination with their lives and careers. In the show’s first season, that list did pretty well for itself, featuring as it did folks like Tina Fey, Howard Stern, and former government employee Barack Obama . Now, we can apparently add Kanye West to Letterman’s list of fascinating friends. This is per Vulture, which reports that Letterman has quietly begun conducting interviews for the second season of the show—which tapes its long-form conversations in front of a live audience—and that West was the first or second of the bunch to be completed. Netflix hasn’t confirmed that the talk took place (or set a return date for Letterman’s series, for that matter), but it’s pretty hard to hold a live interview in front of an audience of devoted rap fans without some information about it slipping out. 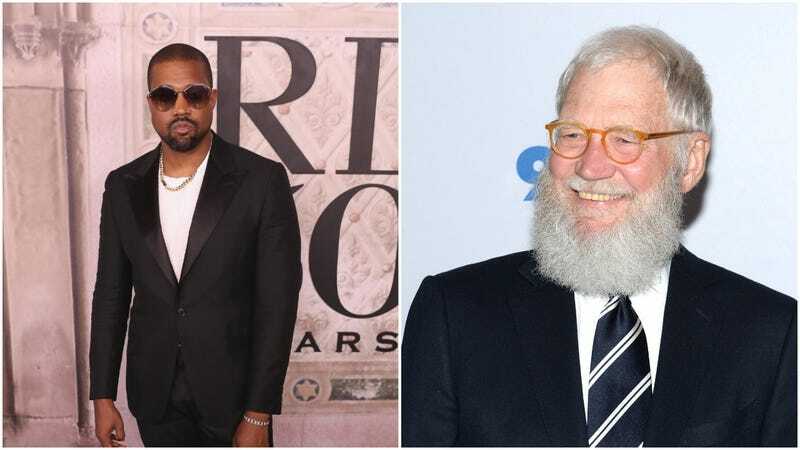 Letterman’s expressed an interest in West in the past; the rapper performed multiple times on Late Show, and Dave pushed his conversation with JAY-Z last year into addressing the two men’s frequently complex relationship. The question, as always, though, is which Kanye showed up for this particular sit-down? If he bounces in in the right mood, West can be a fantastic interview subject, funny, philosophical, and brilliantly honest when talking about his struggles and his art; get the energy wrong though, and you get moments like the infamous TMZ interview from last year, where he started amping and free-associating himself up into talking about things like slavery being “a choice.” Given the tone of Next Guest’s first season, we’re guessing this particular chat will skew toward the former; according to sources who saw it, much of the conversation centered on both men’s relationship and struggles with mental health.